Do you know what SA is? If you’ve been reading my blog from the beginning, you’ll know what I’m talking about. If you’ve just arrived here from Nicola Morgan’s wild birthday party, then I’m sorry to be the party pooper but I think it’s very important that you should know. I’ll tell you why in a moment. SA stands for social anxiety, which is a fear of people and especially of what those people think of the sufferer. I’ve seen SA defined as extreme shyness. While this is probably true for most sufferers, it doesn’t apply to everyone. The origin of SA is a mixture of nature and nurture. Two people can go through the same experiences and only one will get it. Two people can start off with the same characteristics and only one will get it. SA has been recognised as a disorder since 1980. A lot of people suffer from it. Yet most people haven’t heard of it. Even some of those who have it don’t know that there’s a name for it. That’s a shame, because not knowing the name means missing out on treatment, and support from other sufferers. Of course, the best cure is prevention, and that’s where you come in. Even today, in the second decade of the twenty-first century, quiet children are ignored. Children who disrupt classes or are violent are sent for therapy while quiet ones are simply ignored. SA is allowed to fester instead of being nipped in the bud. So, if you’re a teacher, a therapist, a parent, a family member, a friend – in other words if you’re anyone at all – please do something to help a child who is on the path to SA. And if you know someone who suffers from SA – someone who is quiet, appears to be shy, behaves awkwardly – please try to include them and draw them out. If it’s done tactfully, they’ll usually appreciate it. Now I’ll let you return to the party. Do come back here any time. I’m not always this serious. Hello – I wondered if SA might be South Australia…but I sympathise with the Social Anxiety. It is an issue for a lot of people with other disabilities too. Keep purring! Very informative – thanks for educating me! Over from the blog party, thank you for an interesting post. I agree, all to often it’s the noisy disruptive ones that get the help. As a parent though I am glad that my children go to a school that see’s things differently, maybe things are changing now and more schools are like that or maybe the school is ahead of the field. They have special clubs and groups both in the classroom and at playtime to encourage the quiet ones who are not socialising to make more friends. As someone who is shy, I’m glad that my children go there. I explored yours. As you said, its size made that easy. Keep up the good work! Hello – I’m another visitor from Nicola Morgan’s blog party – very interested in your Social Anxiety post. I have 2 grown-up sons who are both on the face of it equally ‘shy’ but only one considers himself to have this condition, and spends a lot of time networking online with others who suffer from it, and the other one doesn’t appear to be at all bothered by it but just lives his life, makes the friends he chooses to make etc. I sometimes struggle to work out why there is such a difference between them, whether it is down to their position in the family or something I’ve done to them! In some ways I do not think it’s helpful for my older son to have defined himself in this way, but on the other hand I suppose it is useful to be able to pin it down to something instead of a kind of generalised anxiety. ps this may come out under my blog name McCallum Ogilvy as I have a wordpress account and am logged in. The question of whether it’s advantageous to define yourself in this way, and whether it’s good to announce it (that’s possibly two questions) is an interesting one. I struggled with it for some time before deciding that it was the right thing for me. I’ve made a note to blog about it soon. Gosh, lots of people got here before me! I liked the way you wrote about this, Miriam, and I’m really glad others were interested too. It’s interesting to think about how shy children (mine both were to a fairly large, though not unusual, degree – monosyllabic when anyone was there, chattering away as soon as guests left) sometimes become gregarious /extrovert and sometimes don’t, and how shyness can sometimes become SA and sometimes not. I wonder what the triggers might be that would make the difference between the common shyness that comes from all sorts of natural fear reactions, and the one that then tips over into something hard to live with? Good luck, Miriam! And happy blogging. You’ve planted the seeds for at least one more blog post…. I’m a visitor via Nicola. I don’t know if you’ve ever seen my blog but I have some horrid health problems and one of the issues I have had to face has been panic attacks when out in public. They stem from a fear of collapsing whilst out and about, so I usually don’t go anwyhere alone, other than Sainsburys, where all the staff know me, and occasionally out to town on good days. So I completely identify with the SA thing. I am happy to report that my kids are all doing well at school, although one of them does have issues stemming from a brain injury and one was very badly and violently bullied. You raise an important issue. I’ve come here via Nicola’s blog-birthday party. I just had to find out what SA is. So glad I came as this is a particular interest of mine having long been a sufferer of severe shyness myself. My shyness has caused me a great deal of unhappiness in the past. It’s not now as bad as it used to be, but still a problem at times. Thanks for coming and I hope your shyness continues to recede. I’m a visitor from the birthday party, but I think we’ve met before through Tania Hershman. I think it’s very brave of you to post this, I must read more of your work. The walls of this world. Yes, they can exist in more ways than one. Lovely to meet you again, I will follow, if your blog allows me too. Yes, I remember your fascinating post on writing and place. I’m not sure that I’m really so brave. I’ve just come to the conclusion that I might as well explain what I’m unable to hide. This ties in with the comment by Sheila, and I promise to blog about it soon. You can follow via RSS. I haven’t set up any other way yet. What an interesting post. Wondering if there are any links with autism re this condition? ie anxiety in social situations? (I have a small grandson with Aspergers so am learning about this condition currently). This works for me, but as I said I’m not cripplingly shy; I was as a child but luckily I learned to cope with it. I can do public speaking. It’s spontaneous conversations that I have trouble with. But then I’ve never been shy. I just have SA. Yes, I believe there are links with autism, but I don’t know enough about that to comment further. I’m here from the blog party too. When I was well, I worked for a charity that puts counsellors into primary schools. I asked teachers to refer, “The disruptive ones, the quiet ones, and the ones you just have a feeling about that they’re not all right.” I found teachers on the whole had a pretty good sense of who was worryingly quiet. Of course, these were the ones who were hardest to help, because dealing with new adults was painful. We did our best. Sorry, by “new adults” I meant unfamiliar adults. Wow, I am totally adding you to my list! As a fellow sufferer, I am with you completely! I could sit down and talk to you for hours about this issue. I look forward to following your blog in the future, and best wishes with your writing, blogging and all the rest! Thank you! I look forward to seeing you here. I don’t think I could sit and talk to you for hours, even though (or maybe because, but not necessarily) you’re a fellow sufferer. I’d dry up before that. But I can write about it…. Another one from Nicola’s party just wanting to pop over and say hi! I’d never heard of SA before reading your post above and appreciate you bringing it to the forefront in your blog today. Fascinating, Miriam. I want to learn more and will be back another day to read your blog at my leisure. Hi Miriam! Also here from Nicola’s party. I think it’s so great that you are being open about social anxiety. Nice to meet you! I thought about it a lot before starting this blog. And again before adding my name to it. So far, all the comments have been positive. Thanks for yours. Nice to meet you, too. Well it wouldn’t be a party without some social anxiety would it? I wouldn’t describe myself as an extrovert necessarily, but all my life I have wavered from extreme confidence to hyper self-criticism. And yet my blog is as much about self-promotion and showing off as it about anything else. It’s endeavours like your’s that make mine seem altogether more shallow. But your self-promotion also does a good job at informing people. I like the autism adverts. Hi – I was on Nicola’s blog, then went to Karen Jones Gowen’s and saw your intriguing title on her blogroll, so now I’m here! Excessive preamble, I’m sorry, but I just thought I’d illustrate how interesting blog parties can be! Thanks for this post, it wasn’t something I was aware of before today. Most people aren’t aware of it. That’s why I’m doing this. I liked your comment to my comment. Yes, there’s no way I could TALK for hours either. Talking drains my energy in a major way. But I could WRITE about it for hours lol! Yes, that would have described me as a child. I still have it a little bit, though getting better as I grow older. I remember, in my 20s, suddenly panicking as I realized I was in a line at the grocery store surrounded by people. It’s a matter of keeping the brain closed to that kind of thinking–just switching it off. Do you do that? Or is that a bad thing? I don’t think it’s bad. If you’ve found something that works for you, go for it. I’m different. I don’t panic when surrounded by people, but the voice in my head often stops me from communicating. I wrote a rhyme about that here. 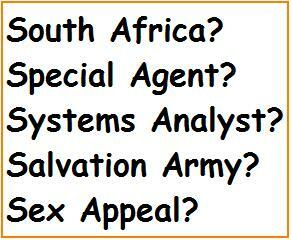 I spent some time trying to work out what SA was before I came over from Nicola Morgan’s blog. I hope you like surprises! Thank you. I’m going to blog about that soon.